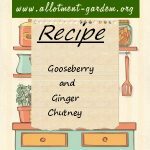 Recipe for Gooseberry Chutney. Perfect with cheese. It can be used after about a month but the flavours continue to develop for a month or two afterwards. 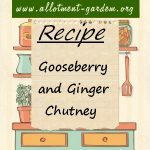 Recipe for Gooseberry and Ginger Chutney. A dark, spicy chutney that is perfect with cheese - can be used in about a month but keeps for much longer. Recipe for Grandma's Gooseberry Upside-down Cake. For the very best way to eat gooseberries do try this family recipe. Great served with ice-cream. Recipe for Fruit Roll dessert. Like a Swiss roll but using a plain sponge and soft fruit with a fruit sauce. Delightful with a dollop of whipped cream. Recipe for Gooseberry Ketchup. Delicious with strong meats like venison, game birds or duck. It even spices up a humble beef burger at the barbecue. Recipe for Gooseberry Jam. Really easy to make as gooseberries are full of pectin and acidic in their own right. 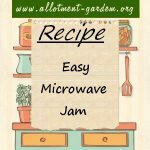 Makes around 8 lbs (3.6 kgs) of jam.